You’ve heard it before: Fool me once, shame on you; fool me twice, shame on me. Connecticut may be in its “shame on me” moment. State leaders have made a deal with Infosys, India’s second largest IT exporter. Connecticut is giving away American taxpayer money in return for promises to create jobs. The question is: Who will get those jobs? It’s worth taking a historical look at Infosys to answer that question. In 2011, the Department of Justice, the U.S. attorney’s office for the Eastern District of Texas, the Department of State, the Diplomatic Security Service, U.S. Immigration and Customs Enforcement’s Homeland Security Investigations and U.S. Citizenship and Immigration Services began investigating Infosys in Plano, Texas. Investigations were a result of a whistleblower tip from Jack “Jay” Palmer, who worked for Infosys from 2008 to 2013. In a record $34 million settlementwith the Justice Department, Infosys admitted that it violated U.S. employment laws. Because Infosys promised to take steps to fix irregularities and agreed to “enhanced corporate compliance measures” to include outside monitoring, the company was not required to admit widespread further wrongdoing, according to then-U.S. Attorney John Bales of the Eastern District of Texas. In the lawsuit, Infosys was accused of using B-1 visas for jobs reserved for American workers. It would have been legally permissible for H-1B visa holders to do the work, but those are limited to 85,000 per year, reserved for foreign workers with “specialty occupations.” B-1 visas are business visitor visas intended for meetings, training or other temporary acts, but not for work. Using the B-1 visas, Infosys violated visa laws and paid its workers the much lower prevailing wage in India. The investigation found that Infosys used 6,500 B-1 visa workers to do work in the U.S. during a five-year period. Moreover, 84 percent of the Infosys forms required for workers’ eligibility had substantive violations. But as set forth in the book, “Sold Out: How High-Tech Billionaires & Bipartisan Beltway Crapweasels Are Screwing America’s Best & Brightest Workers,”by Michelle Malkin and John Miano,the abuse was an intentional and concerted effort by Infosys management to circumvent U.S. visa laws. Whistleblower Palmer said that since Infosys management knew the monitoring of the B-1 system was tenuous, they figured “no one would ever know,” so they “flooded the consulate with (B-1) applications.” Palmer was asked to change contracts to conceal the fact that B-1 visa holders were working on projects, but because he refused, he and his family suffered threats of every kind, including death threats. Although the investigators found “systemic fraud and abuse,” they dropped civil and criminal charges in exchange for the unrivaled $34 million settlement and the admission of paperwork violations. Eastern District of Texas attorney Bales said the settlement severely sanctioned what he called the company’s illegal conduct and required Infosys to correct its practices, but many American workers are left wondering why such blatant fraud and abuse continue unchecked. Clearly, as shown by other reports and lawsuits, even the $34 million slap on the wrist did not produce a sufficient deterrent effect. Allowing Infosys to maintain the deniability of visa fraud (albeit not plausible to those familiar with their history) is a huge mistake and an affront to American workers who have – and who will – lose jobs due to the way Infosys has chosen to operate in America. Bales said this was the first case of its kind for his office, and the extensive investigation showed investigators that Infosys isn’t the only company defrauding the government this way. “We want other companies like Infosys to be on notice that we will be looking,” Bales said. Americans are waiting. 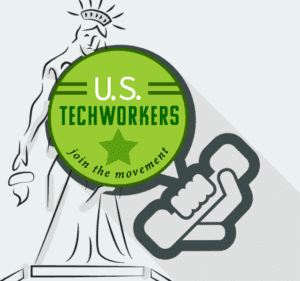 Groups advocating for American workers’ rights, like the Connecticut Tech Workers Coalition, U.S. Tech Workers and Protect U.S. Workers, have been screaming from social media hilltops trying to get the attention of mainstream media, Congress and business leaders in order to stop the widespread fraud and abuse in America’s foreign worker programs, and preserve jobs for Americans. But the trend doesn’t look promising for their cause. According to Hilarie Gamm, in her book “Billions Lost: The American Tech Crisis and The Roadmap to Change,” the total number of B visas issued has jumped from 4 million to nearly 9 million from 1997 to 2016. So the Infosys settlement leaves Americans to wonder about the real value of a seemingly large fine when Infosys stands to gain billions of dollars by continuing to plow the work visa fields. “Infosys has gone to great lengths to obtain its primarily South Asian workforce in the U.S., in particular by utilizing professional H-1B and L-1 work visas to bring South Asians (primarily Indians) into the United States to work in information technology,” according to the suit, which is currently in arbitration. And recently, a former Indian Infosys employee filed suit in Texas alleging he suffered retaliation when he told his superiors the B-1 visa was still being used to bring in people to do prohibited work. Yet, Connecticut’s leaders have made a deal with the same, infamous Infosys. The deal was made under Gov. Dannel P. Malloy, who said: “The bottom line is Connecticut is investing in itself,” but it was partly helped by newly elected Gov. Ned Lamont’s recruiting efforts. Lamont, a fiscal conservative, is facing major budget problems with a projected deficit of $1.7 billion in the next fiscal year. Nonetheless, Connecticut has agreed to pay Infosys $14 million in return for a promise of 1,000 jobs. And a final $2 million grant would be provided now to fund job training. There are several potential problems with the deal. First, there is no requirement that the jobs be for American workers. Most reports on the agreement say Infosys must hire “U.S. workers,” but what qualifies as such? Is an H-1B worker a U.S. worker? Is a foreign student or grad on an F-1 visa who has an OPT (Optional Practical Training) or CPT (Curricular Practical Training) job a U.S. worker? Students on F-1 visas who get OPT or CPT jobs are exempt from Social Security and Medicare taxes, as is their employer, but American students and grads are not. Is Infosys seeking to hit that tax-free easy button? Second, if Infosys does hire American workers, it is problematic that the contract only requires employees be retained for two years. It begs the question whether Infosys can lay off the first round of workers (for which it will receive $4 million) after two years, and then rehire the same employees in the second and/or third round of “job creation,” receiving payment for the same body again and again? Third, if you’ve paid attention to the facts of the 2011 Department of Justice lawsuit and how Infosys misused the B-1 visa to bring in workers from India, the word “training” in that last line (“a final $2 million now to provide job training”) should raise questions about whether Infosys will be using the B-1 visa as an umbrella to shuttle in more foreign workers under the guise of providing training. Regardless, citizens of the Nutmeg State, and states beyond, are doubtful that the picture is as rosy as proponents are trying to paint. When Infosys opened a facility in Raleigh, NC, its stated intent was to pull from the local college community to fill 2,000 positions, but according to Gamm’s book, Kumar admitted that only about 15 percent of the Infosys hires were from local colleges. Connecticut’s 10-member bond commission voted 9-1 to approve the assistance. The only one to vote against the deal was Rep. Chris Davis (R-Ellington), who said Infosys has been one of the leading outsourcers of U.S. jobs to other countries. 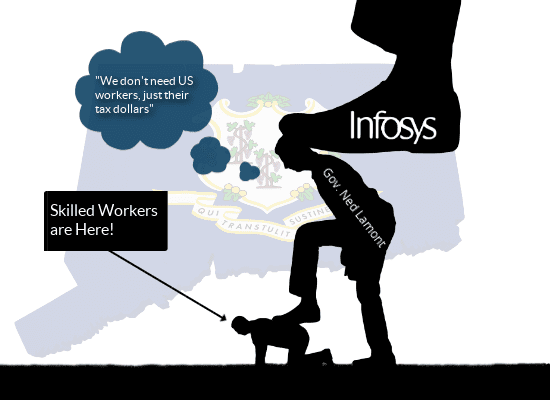 “Infosys outsourced Connecticut-based employees at Eversource and at financial services and insurance industries across Connecticut,” said Davis. Craig DiAngelo was one of the 220 workers laid off at Eversource (formerly Northeast Utilities), when the Connecticut utility company hired Infosys in 2013. The CT Tech Worker Coalition, a group committed to opposing the governor’s deal, is thinking along the same lines: Why is our government handing taxpayer dollars to an Indian outsourcing company notorious for visa violations and for discriminating against – and displacing – American workers? John Robert is one of the Connecticut tech workers helping to organize a rally this weekend in Hartford to protest the state giveaway to Indian outsourcing giant, Infosys. He worked at an insurance company and watched as 350 of his fellow IT workers were slowly replaced by H-1Bworkers. Tata Consultancy Services (TCS), also of India, was responsible for that outsourcing, and Robert said TCS also brought in L-1, B-1 and OPT workers. “I’ve noticed that wherever (Infosys) shows up, pink slips start flying,” said Robert. “It really hit home after the Verizon layoff of 44,000 workers, and Infosys was bringing more than 2,500 jobs to India.” Robert was forced out of his job and could only find work two states away for two-thirds of his salary. “I’m fighting this because Connecticut is my home, and I want to defeat these forces before my daughter enters the workforce,” Robert said. Indiana, where Infosys opened a hub in March 2018 with 250 employees, has been promised up to $31 million in tax credits for producing up to 2,000 jobs, according to The Indianapolis Star. A design hub announced last fall in Rhode Island could earn the company $10 million in state incentives for 500 jobs, Rhode Island Public Radio reported. Texas announced a $3 million land grant for 500 jobs, according to The Dallas Morning News. North Carolina promises Infosys $25 million in state grants in exchange for the promise of 2,000 jobs. The CT Tech Worker Coalition, along with Protect U.S. Workers and U.S. Tech Workers, will hold a protest rally Sat., January 26 at 5pm at the Hartford Elks Lodge, 34 Prospect Street, Hartford, Conn. This entry was posted in Updates and tagged abuse, american workers, courts, foreign, fraud, h-1b, Immigration, infosys, law, ned lamont, tech workers, waste.